The moment that changed everything for the would-be engineer came at an art museum. Dana Hernandez ‘07 (BS/BA) had actually never set foot in one prior to her family’s European vacation, just a few months before she graduated from USD with a degree in industrial and systems engineering. Her awakening came in London’s National Gallery of Art. She followed the docent’s tour and listened in. Now, Hernandez has completely immersed herself into the world she was introduced to that day, by taking on a job that’s tailor-made for an engineer-turned-artist. As it turns out, when you’re the public art program manager for a capitol city like Salt Lake, having the engineering smarts to know both what will work and how to make it work is exactly the bridge that’s needed. 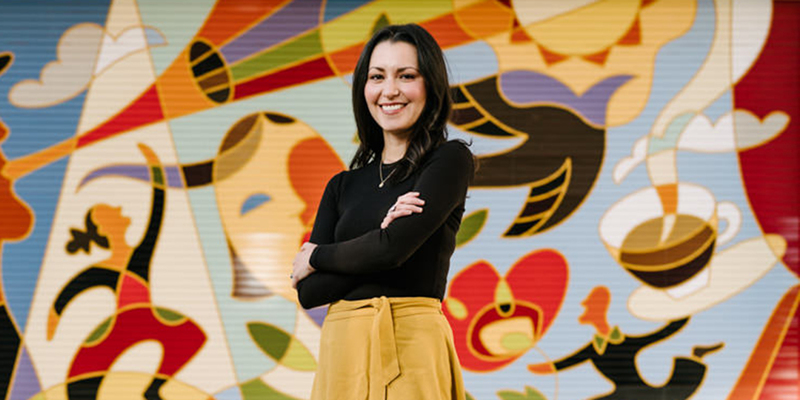 It’s her job to oversee Salt Lake City’s multimillion-dollar slate of public art pieces and steer new proposed projects through the application, approval and construction process. Since she’s constantly working with engineers, it helps to speak their language and be able to read technical documents. She can at once advocate for the artists and help figure out how to make a complicated piece of work happen. In part, it’s her job to work with everyone to make sure the art — much of which is outside and exposed to weather — will hold up. She brings an understanding of how stress, force and other elements may affect a structure and how that structure will respond. That each piece of public art is unique, often oversized, and the first of its kind is just a problem to be solved, Hernandez says. She loves working closely with engineers and fabricators to solve the myriad obstacles that crop up while transforming artistic visions into reality. There may be safety issues with a work being so close to people; environmental factors can come into play as well. She sees her role — indeed, her strength — as making sure the art can stand the way the artist intended, while still bearing the stresses of the environment and the people who interact with it. 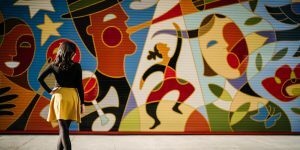 When it comes to public art, people are often encouraged to interact; for Hernandez, that’s part of the fun. After earning her degree, Hernandez worked for Raytheon as an engineer, soon deciding to take some art history classes to learn more about her burgeoning interest. It became clear she needed more art in her life, and she moved to Salt Lake City to study art history as a graduate student at the University of Utah. She began working in the arts and eventually found this perfect fit. Like many cities, Salt Lake devotes a set amount of every capital improvement project — 1 percent in this case — to public art. In this case, too, the engineering helps the art. Hernandez points out that the more proficiently her department uses its time and money, the more art it can make. Going back to that moment at the art museum, did Hernandez even know that something was missing from her life?